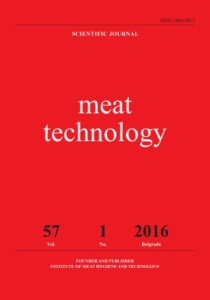 Vol 57 No 1 (2016): Meat Technology | Scientific journal "Meat Technology"
“Meat Technology” is the scientific journal that publishes results of basic and applied research in the field of biotechnical sciences i.e. the following subcategories: veterinary sciences, food engineering and biotechnology. Journal „Meat Technology“ is abstracted in FSTA (Food Science and Technology Abstract). Full text is available in CABI Database, EBSCO publishing, AGRIS Database and www.inmesbgd.com.